Brendan Clarke, Ger O’Brien, Kenny Browne, Connor Kenna (c), Ian Bermingham, James Chambers (Mark Rossiter 88), Greg Bolger, John Russell, Chris Forrester (Dean Kelly 69), Christy Fagan (Sean O’Connor 87), Jake Kelly. Oscar Jansson, Craig Sives, Billy Dennehy, Ken Oman (c), Sean Gannon, Aaron Greene (Gary McCabe 46), Stephen Rice, Ronan Finn, Chris Turner (Daryl Kavanagh 59), Killian Brennan (Conor Powell 84), Gary Twigg. 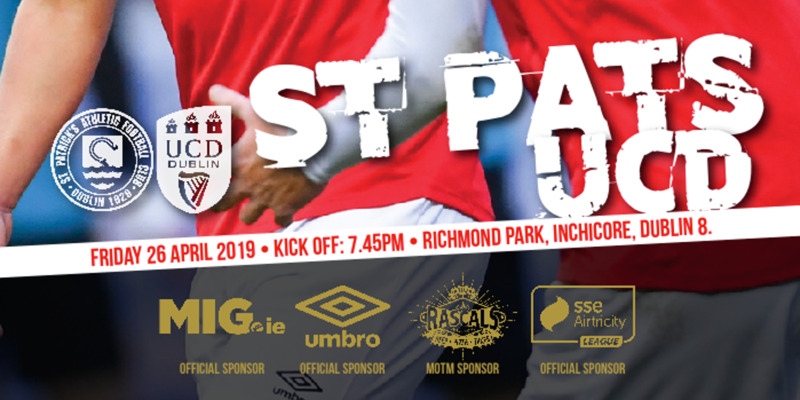 Shamrock Rovers suffered their first Airtricity League Premier Division defeat of the season with a 5-1 loss to a rampant St Patrick's Athletic at Richmond Park. The champions were three down by the 40th minute after two superb Chris Forrester goals and a tap-in from John Russell. 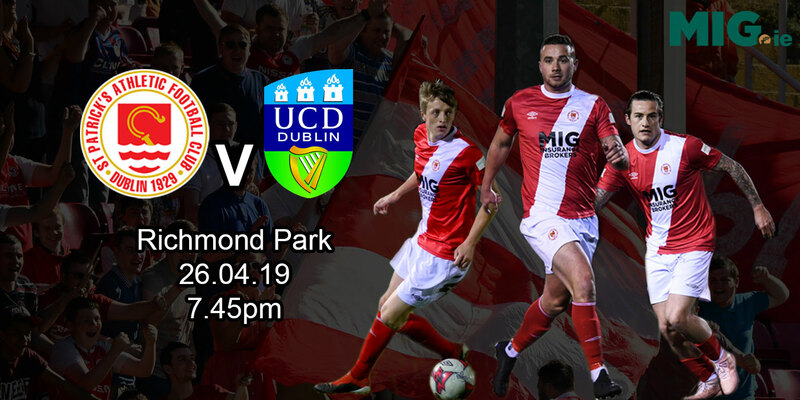 Ken Oman pulled one back for the visitors before the break but Christy Fagan's second-half double meant there would be no comeback this week for the Hoops. The opening goal came after just four minutes. James Chambers found Forrester in space and the ex-Bohs man had time to cut inside and swerve the ball past Oscar Jansson from 20 yards. 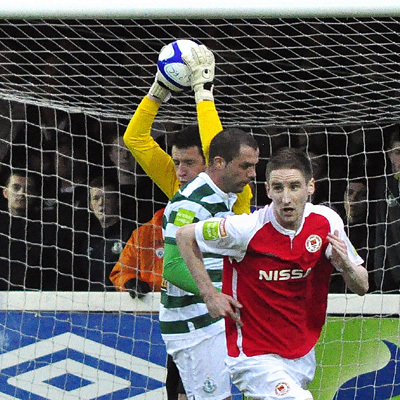 It took Rovers just a few minutes to respond, Gary Twigg rattling the crossbar from Billy Dennehy's cross. Greg Bolger almost caught out Sweden under-21 international Jansson when he tried a speculative shot from way downtown in the 17th minute. Eight minutes later Russell stole into the box to get on the end of Forrester's deflected shot and double Saints' advantage. 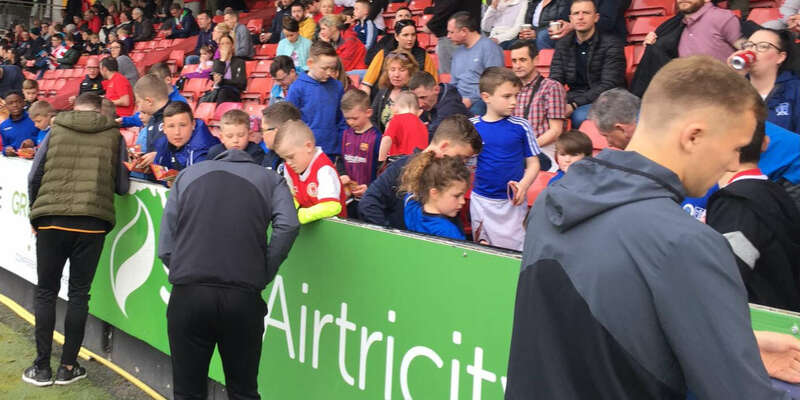 Rovers manager Stephen Kenny won't have been too happy with the concessions, even given the fact that Killian Brennan was filling in at left-back. The third goal came, once again, down the right flank. Bolger was falling but managed to get a long pass away that was intended for Forrester. But the goalscorer was miles offside and sensibly left it for Fagan who had run from deep. Fagan clipped the ball inside to Forrester who scooped the ball over the stranded Jansson to give Liam Buckley's men a deserved 3-0 lead. On the stroke of half-time Ken Oman got on the end of a Dennehy corner and looped the ball over Brendan Clark. Despite all of Kenny Browne and Connor Kenna's first-half heroics, Rovers had their lifeline. The Inchicore side, with Forrester continuing to make hay down the right wing, started the second period on the attack and Bolger should have done better when put through by Russell. Down the other end Twigg sliced an effort badly to jeers from the home support. With 20 minutes left, Christy Fagan put the game beyond the champions. Russell won the ball in midfield and released the 22-year-old striker who coolly rounded Jansson and rolled the ball into the empty goal. Fagan finished off the scoring in the 86th minute. Jake Kelly ran on to a long ball and Jansson came rushing out but lost his footing. The slip was immaterial as the former GAIS ‘keeper was nowhere near an intercept and Kelly lobbed the ball over for Fagan to nod home. When Liam Buckley predicted an entertaining contest he surely wouldn't have imagined anything like this. 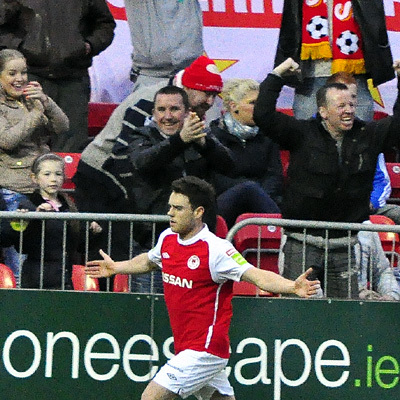 St Patrick's Athletic are now just one point behind the reigning champions and firmly in the title race.